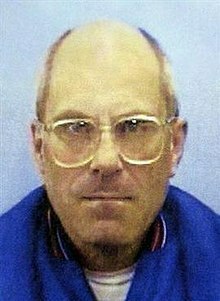 Brian Douglas Wells (November 15, 1956 – August 28, 2003) was an American man who died after becoming involved in a complex plot involving a bank robbery, a scavenger hunt, and a homemade explosive device. Wells was killed when an explosive collar detonated while he was surrounded by police in his hometown of Erie, Pennsylvania. The collar had been forcibly locked onto his neck as part of the plot. The crime was investigated by a task force led by the Federal Bureau of Investigation in conjunction with the Bureau of Alcohol, Tobacco, Firearms, and Explosives and the Pennsylvania State Police, and was described as "one of the most complicated and bizarre crimes in the annals of the FBI". The law enforcement investigators concluded that Wells was a knowing participant in the bank robbery, but did not know that his co-conspirators intended to let him die. Wells's family argues he was not a willing participant, adding to the significant attention the story has garnered in the mass media. In a July 2007 indictment, federal prosecutors alleged that Wells had been involved in planning the botched bank robbery. His co-conspirators Marjorie Diehl-Armstrong and Kenneth Barnes were indicted by a federal grand jury on charges of bank robbery and conspiracy, as well as weapons charges, while other co-conspirators had already died. In 2008, U.S. District Judge Sean J. McLaughlin sentenced Barnes to 45 years in federal prison. Two years later, Diehl-Armstrong was also found guilty and was sentenced to life in prison in 2011, where she died of breast cancer in 2017. Wells, a high-school dropout, had worked as a pizza delivery man at the Mama Mia’s Pizzeria in Erie, Pennsylvania for ten years before his death. On the afternoon of August 28, 2003, Wells received a call to deliver two pizzas to 8631 Peach Street, an address a few miles from the pizzeria. The address was WSEE-TV's transmitting tower at the end of a dirt road. According to law enforcement reports, Wells had allegedly participated in the planning for the robbery and was aware of the complex plot, although he believed the bomb would be fake rather than live. Upon arriving at the television tower, Wells found the plot had changed, learning that the bomb was real. The events at the tower that led to the bomb being attached to Wells's neck have never been firmly established, but there is evidence that Kenneth Barnes was present at that time. After the bomb was placed, Wells was given a sophisticated home-made shotgun, which had the appearance of an unusually shaped cane, and nine pages of hand-written instructions. He was instructed to claim that three black men had forced the bomb on him and were holding him as a hostage. Wells's family disputes this account of the events at the television tower, and have stated that Wells was accosted at gunpoint by strangers and forced to participate. The instructions, addressed to "Bomb Hostage", listed a series of strictly timed tasks to collect keys that would delay the detonation, and eventually defuse it. Additionally, it warned that Wells would be under constant surveillance, and any attempts to contact authorities would result in the bomb's detonation. "ACT NOW, THINK LATER OR YOU WILL DIE!" was scrawled at the bottom of the instructions. The first task was to "quietly" enter the PNC Bank on Peach Street and give the teller an affixed note demanding $250,000, and to use his shotgun to threaten anyone who was not co-operating or attempting to flee. Upon entering the bank around 2:30,  Wells slid the note to a teller. The note stated that in 15 minutes the bomb would explode and that the full amount must be handed over within that time. Unable to access the vault that quickly, the teller gave Wells a bag with $8,702 in it, with which he exited the bank. Around 15 minutes later, police spotted Wells standing outside his Geo Metro vehicle, and promptly arrested him. Wells claimed that three unnamed black people had placed a bomb around his neck, provided him with the shotgun, and told him that he had to commit the robbery and several other tasks, lest they kill him. The police initially did not attempt to disarm the device. The bomb squad was first called at 3:04 pm, at least 30 minutes after the first 9-1-1 call. At 3:18 pm, just three minutes before the bomb squad arrived, the bomb detonated and blasted a fist-sized hole in Wells's chest, killing him within a matter of minutes. Wells was believed to have been killed by Diehl-Armstrong and her conspirators to reduce the number of witnesses against herself and others. The event was broadcast on television and the footage subsequently found its way to video-sharing sites. Though the note claimed that he would gain extra time by each found key, police later traveled the route on the note and could not complete it in the time the note allotted to Wells. In other words, regardless of what had unfolded, Wells would not have had enough time to get the bomb defused. Wells was allegedly drawn into the plot through Barnes, whom he knew through a mutual acquaintance named Jessica Hoopsick. The plot was hatched to get funds to pay Barnes enough money to kill Diehl-Armstrong's father, Harold Diehl, so that Diehl-Armstrong would receive an inheritance, according to authorities. However, Wells was handed only $8,702 by the teller, far from the $250,000 needed for the killing. Furthermore, the inheritance Diehl-Armstrong reportedly coveted was ultimately denied to her. Her father's estate had once been valued near $2 million, but gifts to friends had lowered the value to less than $200,000 at his death in July 2014, at the age of 95. In an interview included in the Netflix miniseries Evil Genius about the Wells case, Harold Diehl reported that he had cut off financial support for his daughter decades earlier due to her criminal behavior and failure to hold a steady job. Additionally, his last will and testament left only $2,000 to Diehl-Armstrong, yet the estate's obligation to pay outstanding medical bills before inheritances meant she received nothing. On August 31, a colleague of Wells, Robert Thomas Pinetti, was found dead in his home. While he was never directly linked to the crime, investigators noted that his behaviour changed after Wells's murder and he became paranoid; he was to be interviewed by police the day after his death. His death was ruled an accidental drug overdose. On September 20, William "Bill" Rothstein, who lived in a house near the radio tower, called police to inform them that the body of a man, James Roden, was hidden in a freezer in a garage at his house. Rothstein was promptly arrested. After he telephoned police, but before they contacted him at his home, Rothstein wrote a suicide note indicating that his planned suicide had nothing to do with Brian Wells, though he never attempted suicide. In custody, Rothstein claimed that Marjorie Diehl-Armstrong, an ex-girlfriend he had dated in the late 1960s and early 1970s, had murdered her then-boyfriend Roden with a 12-gauge shotgun during a dispute over money. Rothstein claimed she subsequently paid him $2,000 to help hide the body and clean the shooting scene at her home. He claimed to have called the police out of fear, describing Diehl-Armstrong as dangerous and manipulative. The following day, she was arrested. A musical prodigy who graduated near the top of her high school class, Marjorie Diehl-Armstrong's adult life was characterized by hoarding and bipolar disorder. She was known to authorities, due to her husband and several later partners dying under suspicious circumstances. In 1984 she was arrested for killing boyfriend Robert Thomas, but was acquitted on grounds of self-defense. Rothstein had been implicated in a 1977 murder after having given a handgun to a friend who used the weapon to murder a romantic rival; Rothstein later attempted to destroy the weapon but was granted immunity from prosecution in exchange for his testimony. Rothstein was admitted to the Millcreek Community Hospital on July 23, 2004. Rothstein had previously been diagnosed with non-Hodgkin's lymphoma showing myeloproliferative lymphoma, diffuse large cell type. Rothstein died of lymphoma on July 30, 2004, aged 60. Floyd Stockton (Stockling), a friend who lived at Rothstein's house during the time of the bank robbery plot, was also believed to be involved. He was granted immunity for his testimony against Rothstein, but was never called to testify in court due to illness. In January 2005, Diehl-Armstrong pleaded guilty but mentally ill to the murder of Roden and was sentenced to seven to 20 years in prison. She is believed to have killed Roden to prevent him from informing authorities about the bank robbery plot. In April 2005, Diehl-Armstrong confided to a state trooper that she had information about the Wells case, and after meeting with FBI agents, said she would tell them everything she knew if she was transferred from Muncy State Penitentiary to a minimum-security prison in Cambridge Springs. During a series of interviews, Diehl-Armstrong admitted to providing the kitchen timers used for the bomb, and said that Rothstein was the mastermind of the plot and that Wells had been directly involved in the plan. An FBI affidavit reported that two witnesses confirmed that Wells had conversations about the robbery about a month before it occurred. In late 2005, Kenneth Barnes, an ex-television repairman who was in jail on unrelated drug charges and friend of Diehl-Armstrong, was turned in by his brother-in-law after revealing details of the crime to him. Barnes told investigators that he would tell them the whole story in return for a reduced sentence. He told them that Diehl-Armstrong was the mastermind of the crime and that she wanted the money to pay Barnes to kill her father, whom she believed was wasting her inheritance. In July 2007, U.S. attorney Mary Beth Buchanan announced that the investigation was over, and that Diehl-Armstrong and Barnes had been charged with the crime, with Diehl-Armstrong as the mastermind. The deceased Rothstein and Wells were also indicted as conspirators to the crime. Buchanan also said that Wells had been involved in the scheme from the beginning, and had thought that the bomb was fake and that the instructions in his pocket would provide him with an alibi if he got caught. However, she revealed that Wells was betrayed by his conspirators and that he was fitted with a real bomb that would have exploded even if it was removed. When he discovered that the bomb was real, Barnes said a pistol was fired in order to force Wells's compliance, and witnesses confirmed hearing a gunshot. On July 29, 2008, U.S. District Court Judge Sean J. McLaughlin made an initial finding that Marjorie Diehl-Armstrong was mentally incompetent to stand trial for the bombing due to a number of mental disorders, indicating that this ruling would be reviewed after Diehl-Armstrong had received a period of treatment in a mental hospital. She was then transferred for treatment in a federal prison mental-health facility in Texas. On September 3, 2008, Kenneth Barnes pleaded guilty to conspiring to rob a bank and to aiding and abetting. On December 3, 2008, Barnes was sentenced to 45 years in prison by a federal judge in Erie for his role in the crime. On February 24, 2009, Judge McLaughlin scheduled a hearing for March 11, 2009, to determine if Marjorie Diehl-Armstrong was now competent to stand trial. Judge McLaughlin had ruled Diehl-Armstrong incompetent to stand trial in July 2008. On September 9, 2009, the judge determined that she was now competent to stand trial. In October 2010, Diehl-Armstrong stood trial in Erie, Pennsylvania and took the stand to testify on her own behalf as part of her defense. She asked for a change of venue, arguing that extensive media coverage of the case prevented her from receiving a fair trial. Judge McLaughlin denied this request, noting that while the allegations were unusual, "the [news] coverage as a whole has been about as factual and objective as it could be under the circumstances." On November 1, 2010, Diehl-Armstrong was convicted of armed bank robbery, conspiracy to commit armed bank robbery, and of using a destructive device in a crime. On February 28, 2011, she was sentenced to life in prison, to be served consecutively with the prison term previously imposed in 2005 for killing Roden. In November 2012, the Court of Appeals for the Third Circuit affirmed her conviction. In January 2013, the U.S. Supreme Court denied her petition for certiorari, declining to hear her case. In December 2015, Diehl-Armstrong lost a second appeal of her conviction. She died in prison of breast cancer on April 4, 2017, at the age of 68. In 2018, Jessica Hoopsick admitted to involvement in the plot. In 2003, she was a prostitute and involved with drugs, whose regular clients included Wells and Barnes. Melissa Chan of Time wrote: "Hoopsick says a conspirator approached her to find a 'gopher' who could be scared into robbing a bank." In the 2018 documentary Evil Genius, Hoopsick identifies the conspirator as Barnes and alleges she recommended Wells, whom she described as "a pushover". Admitting to setting Wells up in exchange for money and drugs, Hoopsick expressed regret for her role and claims Wells had no advance knowledge of the bank robbery. ATF agent Jason Wick stated Hoopsick was uncooperative in 2003, but authorities "always believed that [she] knew more" about the case; however, Wick also expressed concern that Hoopsick might not be a credible witness. The incident and the subsequent investigation were frequently covered in American national media as the case continued to develop. When the story broke, many wrongly believed the incident to be terrorism-related. America's Most Wanted featured the story three times with newly released evidence in hopes officials could gather new clues behind the case. The story was described in detail in the January 2011 issue of Wired magazine. In 2012, Jerry Clark and Ed Palattella published Pizza Bomber: The Untold Story of America's Most Shocking Bank Robbery (ISBN 0425250555), a true-crime book detailing the events. In May 2018, Netflix released a documentary series about the case, Evil Genius: The True Story of America's Most Diabolical Bank Heist. Due to its novelty and complexity, the story remains a fascination for many people. Since 2017, it has been discussed on a number of podcasts of varying subjects. Georgia Hardstark of My Favorite Murder detailed the story in a July 2017 episode. In August 2017, the story was reported on by Dave Warneke for the Australian podcast Do Go On. Swindled, a podcast dealing with white-collar crime, covered the Wells story in February 2018. In April 2018, Casefile True Crime released an episode about the incident. In May 2018, the podcast Stuff You Should Know covered this story in an episode. In July 2018, the YouTube series BuzzFeed Unsolved released an episode about the case. The incident has been the apparent inspiration for a number of works of fiction. A short lived 2006 NBC-TV series, Heist, dramatized the incident in a pilot featuring Zac Efron as a teenage pizza delivery boy with a bomb on his chest forced to commit a robbery. As in the real-life incident, the bomb was detonated and killed the victim, though in the TV show, the mechanism was updated with a wireless transmitter. It is believed that the 2007 Colombian film PVC-1 was inspired by the case. The 2011 American comedy film 30 Minutes or Less depicts a pizza delivery man being forced to wear a collar bomb and rob a bank. The film's apparent similarity to the Wells case was criticized by Wells's family, but the Sony Pictures Motion Picture Group denied that the filmmakers had any awareness of the Wells case. A collection of news articles that reported developments in the Brian Wells story was analyzed in a scientific study of information novelty. ^ "Marjorie Diehl-Armstrong Cause of Death - How Did She Die?". ^ Rebecca Hawkes (2018-05-11). "Who was the Pizza Bomber? The gruesome story behind Netflix's new crime sensation". The Telegraph. Retrieved 2019-04-17. ^ Sean D. Hamill (2007-07-11). "Indictments Said to Be Near in '03 Robbery Bomb Death". The New York Times. Retrieved 2019-04-17. ^ "Bank Robber May Not Be Perpetrator". WSEE News. August 29, 2005. Archived from the original on August 29, 2005. Retrieved August 16, 2011. ^ "Pizza Deliveryman Who Robbed Bank Had Neck Measured for Bomb Collar". Fox News. Associated Press. 2007-07-19. Retrieved 2010-09-30. ^ Martin, Jim (2008-12-03). "Barnes gets 45 years". Goerie.com. Archived from the original on 2016-01-10. Retrieved 2019-02-11. ^ Mandak, Joe (2010-10-13). "Pa. collar-bomb trial jury selection begins". Associated Press News. Retrieved 2019-04-16. ^ "Collar Bomb Probe Gets Weirder". Retrieved 2017-11-23. ^ Caniglia, John (2007-07-12). "Double-crossed: Erie pizza bomber Brian Wells was both victim and conspirator". The Plain Dealer. p. 3. Archived from the original on 2007-08-22. Retrieved 2007-07-15. ^ "CNN.com - Transcripts". transcripts.cnn.com. Retrieved 2019-02-12. ^ a b c d "The Incredible True Story of the Collar Bomb Heist". Retrieved 2017-11-03. ^ "Jury Convicts Woman in Collar Bomb Robbery". Retrieved 2019-02-19. ^ "Jury Convicts Woman in Collar Bomb Robbery". Retrieved 2017-11-23. ^ a b "Case 81: Brian Wells - Casefile: True Crime Podcast". Casefile: True Crime Podcast. 2018-04-14. Retrieved 2018-04-15. ^ a b c John Caniglia (2007-07-11). "Erie Bomb Victim was the Dupe in a Greedy Plan". The Plain Dealer. Retrieved 2011-08-16. ^ STUCK, LEANNE (28 August 2015). "12th Anniversary of Erie Pizza Bomber Case". ^ Nephin, Dan (2007-07-11). "Indictment: Bomb victim in on bank plot". USA Today. Associated Press. Retrieved 2011-08-16. ^ "Woman in pizza bomber case to get nothing from father". TribLIVE.com. Retrieved 2017-11-03. ^ "Co-worker of man killed in Erie bank robbery blast dies at home". old.post-gazette.com. Retrieved 2018-12-18. ^ a b Rivera, Geraldo (2015-03-25). "Pizza Man Bombing Remains Odd Mystery". Fox News. Retrieved 2018-12-18. ^ "Evil Genius: the True Story of America's Most Diabolical Bank Heist | Netflix Official Site". www.netflix.com. Retrieved 2018-12-18. ^ a b c "Erie's Diehl-Armstrong recalled as unique and deadly criminal". goerie.com. Erie Times-News. 4 April 2017. Retrieved 5 April 2017. ^ "Pizza collar-bomb case solved, official says". Retrieved 2017-11-03. ^ "Erie bomb victim was the dupe in a greedy plan". Retrieved 2017-11-03. ^ "Indictment: Bomb victim in on bank plot - USATODAY.com". usatoday30.usatoday.com. Retrieved 2017-11-23. ^ a b "Collar Bomb Bank Robber Gets 45 Years". Retrieved 2017-11-03. ^ "Diehl Armstrong: Mentally Incompetent". W.I.C.U 12. 2008-07-29. Archived from the original on 2008-12-06. Retrieved 2008-08-29. ^ "Pennsylvania 'Pizza Bomber' Co-Defendant Pleads Guilty in Bizarre Bank Heist Plot". Fox News. 2008-09-02. Archived from the original on 2008-09-07. Retrieved 2008-09-02. ^ "Collar Bomb Bank Robber Gets 45 Years". CBS/AP. December 3, 2008. Retrieved August 16, 2011. ^ "Diehl-Armstrong faces life sentence". GoErie.com. ^ ""Pizza Bomb" Update: Marjorie Diehl-Armstrong sentenced to life for bizarre Pa. collar-bomb killing". CBS/AP. March 2, 2011. Retrieved August 16, 2011. ^ a b "Pizza-bomber robbery appeal rejected". CNN. January 15, 2013. Retrieved January 17, 2013. ^ Diehl-Armstrong v. U.S, no. 12-7609, (docket). Retrieved January 17, 2013. ^ "Diehl-Armstrong comes up short in 2nd appeal". goerie.com. Erie Times-News. 29 December 2015. Retrieved 11 September 2016. ^ "Part 3: The Suspects". Evil Genius: the True Story of America's Most Diabolical Bank Heist. Season 1. Episode 3. 11 May 2018. 30 minutes in. NetFlix. Trooper Gluth: Ken had a connection to Brian Wells that they had a mutual friend that was a prostitute. Jessica Hoopsick was the friend, the mutual friend, that both Ken and Brian associated with. [...] Jerry Clark: Brian Wells would drive Jessica Hoopsick to purchase crack cocaine from Ken Barnes. Actually consummate their sexual transaction on the second floor of Mr. Barnes' residence. Mr. Wells would pay Jessica Hoopsick for the transaction. Jessica Hoopsick would then buy crack cocaine from Ken Barnes. ^ "Part 4: The Confessions". Evil Genius: the True Story of America's Most Diabolical Bank Heist. Season 1. Episode 4. 11 May 2018. 37 minutes in. NetFlix. Jessica Hoopsick: One day I walked in Ken's house and him and a couple of his friends were planning on robbing a bank. ... I was high for about three days and I called Kenny and told him: "Can you give me some money now if I tell you this guy's name?" He said, "well, I can give you some crack now," and I said okay. I went down there and said, "I know this guy, Brian. And he's, you know, he's a pushover. You could probably use him." ^ "Part 4: The Confessions". Evil Genius: the True Story of America's Most Diabolical Bank Heist. Season 1. Episode 4. 11 May 2018. 39 minutes in. NetFlix. Jessica Hoopsick: I had a lot of remorse for a lot of stuff I did, and a lot of shame and guilt. ... [Brian] had no parts in planning. He had no idea what was going to happen to him. ^ Johnson, Kevin (2003-09-17). "Was pizza deliverer a robber or a victim?". Usatoday.Com. Retrieved 2009-10-18. ^ "The Erie Collar Bomber". America's Most Wanted. Archived from the original on 2009-06-19. Retrieved 2006-09-05. ^ Schapiro, Richard (December 27, 2010). "The Incredible True Story of the Collar Bomb Heist". Wired. Retrieved August 12, 2011. ^ Clark, Jerry; Palattella, E d (2012). Pizza bomber: the untold story of America's most shocking bank robbery (Berkley premium ed.). New York: Berkley Books. ISBN 9780425250556. ^ Greene, Steve (2018-04-30). "Evil Genius Trailer: Netflix and Duplass Brothers' Pizza Bomber Series". IndieWire. Penske Business Media. Retrieved 2018-05-10. ^ "94 - The Collar Bomb Heist - Do Go On - Omny.fm". Omny.fm. Retrieved 2018-05-16. ^ "Brian Wells Archives — Swindled | a podcast about white-collar crime and corporate greed". Swindled | a podcast about white-collar crime and corporate greed. Retrieved 2018-03-21. ^ "Colombia packs heavy for Cannes | Variety". 2016-01-22. Archived from the original on 2016-01-22. Retrieved 2018-06-21. ^ "Cinta colombiana sobre el 'collar bomba', premiada en Festival de Cine de Tesalónica (Grecia) - Archivo Digital de Noticias de Colombia y el Mundo desde 1.990 - eltiempo.com". 2016-03-05. Archived from the original on 2016-03-05. Retrieved 2018-06-21. ^ Peckham, Matt. "'30 Minutes or Less' Comedy Upsets Family of Real-Life 'Pizza Bomber'". Time. ISSN 0040-781X. Retrieved 2018-06-21. Silver, Jonathan D. (2005-08-25). "Killing of pizza deliveryman with necklace bomb still unsolved". Pittsburgh Post-Gazette. Archived from the original on 2011-06-22. Retrieved 2007-07-10. "Brian Wells". Brianwells.net. Archived from the original on 2011-07-22. Retrieved 2018-12-18. Website created by Brian's brother; contains reproductions of the nine page letter, along with photos of the cane gun and collar bomb. "Brian Wells". Malefactor's Register. Archived from the original on 2007-03-09. Collarbomber FBI Profile August 27, 2004 press release from the Pittsburgh, Pennsylvania FBI website. "Brian Wells". Find a Grave. Retrieved August 10, 2010.